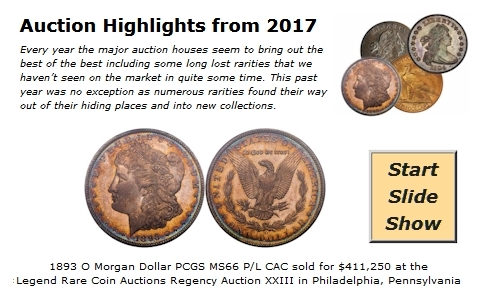 The overall coin market may be lower but there are still plenty of buyers at new levels. Some dealers and collectors are offering coins at discounts, while many more dealers and collectors are taking advantage of these so-called fire sales. Some prices have fallen in the last few weeks and we are seeing more offers to sell on the dealer teletypes. However, many dealers have customers looking at these opportunities as a way of obtaining coins that were not available six months ago. In this week’s HD Wholesale Market Dealer Price Guide, many issues have declined due to an increase in the number of sellers in the market. We are seeing lower prices realized in most auctions, yet, there are still many increases in most Gold series. Premiums for generic U.S. Gold are higher than normal and buyers cannot get enough coins. The most common $2 ½ Gold, $5, $10, and $20 are rising in most grades from Good thru MS65. Even some of the rare dates have increased, especially when the coins have not been on the market for a while. The ever-popular 1883 O $10 Gold increased in grades XF through MS60, with the latter now at a Market price of $29,500. The 1861 S $20 Paquet in AU58 moved to a higher $147,500. Classic Silver and Gold Commemoratives continue to languish in dealer inventories. The only ones that seem to sell are heavily discounted, especially within the Gold issues. Most issues fell in grades MS63 to MS67 this past week. While the Pan Pac $50 Gold has not fallen, the usual market makers are not as visible as they were in the past. Most Silver Commemoratives have not been easy to sell for at least the last year. Buyers in this area usually want Premium Quality coins, which means the coin must look like the next higher grade. Even then, it is still a question of price.